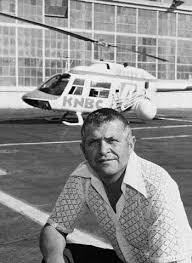 Whatever Happened to Helicopter-Flying Traffic Reporters? I was driving around with my phone giving me directions. It had me on one route but made the announcement that I needed to take another route. Apparently, there was traffic up ahead that needed to be avoided. As I made my way through the twist and turns of getting somewhere, a question came to my mind. Whatever happened to traffic reporters? I am not talking about the people who show us some screen filled with red lines. I am talking about the people who flew around in helicopters and scouted the different arteries into the city. They would get on the radio and try to talk above the sound of the rotary blades. In the background, you could hear the thump, thump, thump of those blades. It was like they were on an episode of M*A*S*H.
Through the thumping, drivers had to listen for their interstate number and hope that it never came up. Whatever happened to those guys? I think they went away when our phones became our own personal traffic reporters. Now, the voice in our phone tells us where to go. It tells us about the accident up ahead. It tells us the quickest way to our destination. No more guessing. No more listening for our interstate number. The phone has put helicopter-flying traffic reporters out of work. Those are the thoughts that went through my mind as my phone told me where to drive. Then, another thought went through my mind about perhaps the most famous traffic reporter of all time. Although, he was not famous for being a traffic reporter. Gary Powers was a big part of the Cold War. As a U-2 pilot flying, he was on a secret spying mission over the Soviet Union when he was shot down. It was a huge issue for the United States when the spy missions were discovered. Eventually, Powers was exchanged for a Soviet spy held by the United States. That story was covered in the movie Bridge of Spies. In 1977, he was working as a traffic reporter in Los Angeles. While returning to the airport, his helicopter ran out of fuel and crashed. According to the investigation, Powers deviated during the descent to miss a playground full of children. That move made the crash more devastating, and he was killed. I hate to end a post on such a depressing note, but those are the thoughts that went through my mind as my phone directed my through traffic.